Hoover came to wide public attention as President Woodrow Wilson’s food administrator during World War I and, after the war, as head the American Relief Administration, which provided food to warravaged Europe and even Soviet Russia. 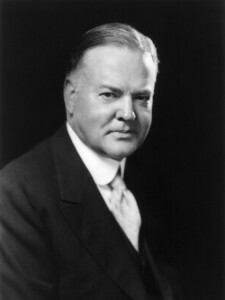 (“Whatever their politics,” Hoover declared, “they shall be fed.”) Hoover was nominated by the Republican Party as its presidential candidate in 1928. He defeated Democrat Al Smith and was almost immediately confronted by the Stock Market crash of 1929 and the Great Depression. Hoover steadfastly resisted giving direct federal aid to the legions of the jobless, homeless, and hungry, believing that to do so would irreparably destroy individual initiative and forever change the relation of the government to the people. His administration’s failure to deal effectively with the economic emergency resulted in Hoover’s loss to Franklin D. Roosevelt in 1932. Unjustly, many Americans blamed Hoover not merely for failing to alleviate the Depression, but for having caused the Depression.